I think it’s about time for an update to this post. It’s been a month and I’ve been sticking to the new routine, using The Body Shop’s Rainforest Haircare. Infact, I’ve finished the bottles that I was given at their blogger event in the Summer. I know it’s taken me a while to review, but not only did my hair need to get used to the new products, I needed to get used to the new routine too. It’s a big difference going from normal detergents and condtioners and it takes a while to adjust. 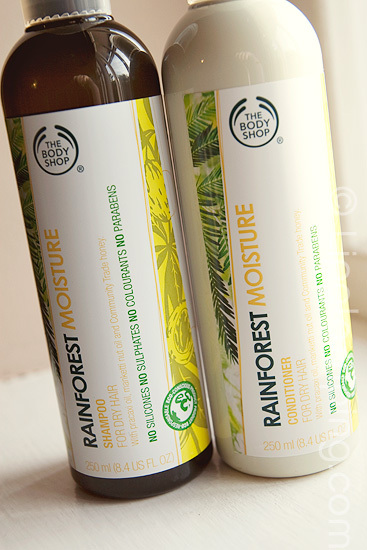 So, I’ve been trialling The Body Shop Rainforest Moisture variety which is aimed at dry hair types. My hair is coloured (frequently) and as a result, a little over-processed and dry. It needs something that isn’t stripping. My first impressions of this weren’t positive. Within the 3rd use, my hair felt like straw. It was unmanageable and bushy… rough and knotty. I tried using more conditioner, but didn’t experience any improvements. I nearly gave up on it completely. Instead, I tried using it in conjunction with my normal conditioner. I was worried that by using a normal conditioner, I’d be giving the sls-free shampoo too tough a job to clear my hair of build-up… but for me? This is working well. The shampoo takes a little getting used to, it doesn’t lather very well on the hair. It’s recommended to rub it between your palms to build up a small amount of lather before applying to your hair and this does make a difference. I simply found that the condtioner didn’t do enough to smooth the hair shaft. Whilst I’m not in love with either of these products, I would purchase the shampoo again. It left my hair feeling clean and since getting rid of my scalp issues (thanks Nizoral!) it hasn’t caused any further irritations. Priced at £4 for 250ml, I think the range is pretty good value for money considering the natural and eco-friendly ingredients, but I’d need to see more moisture from the conditioner before I’d purchase again. You can buy The Body Shop’s Rainforest Haircare range online or instore. I also tried the Naked shampoo. once and never again. I have extremely processed hair and I honestly thought that my hair might fall out. AWFUL. Saying that, I’ve heard very good things from friends about the pureology range – which is far more expensive, but SLS free. Perhaps if you’re going to cut out the SLS it’s worth spending the extra money for other added goodies to stop the straw effect? As an aside- SLS free shampoo’s won’t lather, as it’s the SLS’s themselves that produce the bubbles! I used the one for oily hair, and I suffer with horrible oily hair! It made my hair horrible, it’s quite long and the shampoo made it so tangley I was frightened I would have to cut the comb out. The price is amazing for something so eco friendly, but it’s just not for me. if you guys get organix haircare (http://www.organixhair.com/) at your side of the world, i HIGHLY recommend it. the shea butter shampoo/conditioner in particular is quite moisturizing!